While ordering some books online I came across this small book first published in 1946 and reprinted in 1996 by Ambassador Books, Belfast. Since we visit the place in Edinburgh where Moody and Sankey preached and sang, I am curious to know the details of their ministry together. The author relays the story of how Moody and Sankey met in Indianapolis, to their many evangelistic tours, to their varied and amazing friendships and of course to their inspiring work. I love the story of Sankey composing the hymn “The Ninety and Nine” in Scotland when Moody asked him to sing a solo about the Great Shepherd. Sankey took a local poem to the organ with him and sang and composed the song on the spot. The song was never changed. His friendships with P.P. 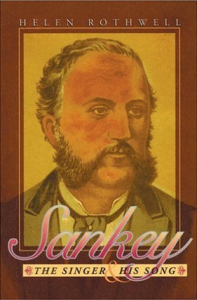 Bliss and Fanny Crosby are interesting, especially knowing that Sankey was blind in the final years of his life also. I realize that Sankey represents a freer style of singing than what was popular then, particularly in England and Scotland, but I believe it was a movement, not to the left of the whole spectrum but closer to the sensible middle of where God’s churches always have been.